My work is about becoming a #formidableWoman, what it means to become so, and how this happens. It is an exploration of the interconnection of all things. I am an empathic-creative, so don’t be surprised at anything you find here. On my blog, you’ll read stories and poems and view art. Sometimes, you’ll read social commentary or notes on the spiritual journey. I’ll also keep you up to date on readings and signings and other news of note or of none. I desire to support, comfort, inspire, and challenge you, to feed you beauty, peace, and belonging, as these are the antidotes to our cultural malaise. Under The Young Writer’s Idea Box tab in the main menu, you’ll find free prompts for writing teachers of young (K-12) writers and, ideas for writers of all ages as well. You are welcome here: tell me your stories, make comments & suggestions, ask questions. We’re in this together. 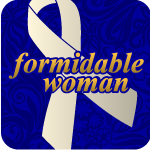 If you consider yourself a peacekeeper and would like to stand with me for peace, snag the html code in the sidebar to get your #formidableWoman badge to display on your blog or in your email away message (or simply right click on the image below and copy). If you’d like notice of my new publications in your inbox, please input your email address below and click the check box to subscribe. I wish to subcribe to your email list. Thank you. And you as well. Thanks for stopping by. What a nice vision. I fully support peace making. Who does not though? :-) I admire people who put real time and effort in it. I think writing, poetry, art and painting are suitable means to transport the message. All the best! Thank you, Mathias. & thank you for stopping by formidable woman sanctuary. Being at peace is very different from peace making. While I strive to model “the change I wish to see in the world,” I do find myself to be so completely human, often failing to be “at peace” but continuing to practice peace one moment at a time, one breath at a time. I looked at your blog. At first glance, it seems intellectually quite academically oriented. It makes me wonder if you are a professor, or student or otherwise academically inclined. Tell me. Maybe being at peace is an important precondition for being able to most effectively creating peace?! What does work best for you to become at peace with yourself? Yes, you are right, I am beside many other things studying again (psychology), why I use my researches to write some essays for my blog too. I need to take care that it doesn’t look too academically. Thanks a lot for your feedback! Mathias! Thanks for your kind commentary on my paintings. Making them is one way I practice peace. I differentiate “practicing peace” from “being at peace” precisely because most people, I think, may believe, as you suggest, that one must first be at peace to teach peace or first feel peaceful in order to practice peace. I maintain that it is precisely the opposite. One teaches peace by the practice of it. Let’s say, for example, that I find myself in the middle of a family disagreement, something that has happened quickly, tempers have flared between adult siblings. One sibling has left the building in anger. The energetic, vibrational quality in the room is electric, prickly, unnerving. The hair on everyone’s skin is standing at attention. As for me, adrenaline surges and my heart rate spikes. My breath becomes shallow. My capillaries constrict as do my pupils. All this happens in seconds and automatically, my sympathetic nervous system taking over. If I am unaware, my primal brain will take it from here, trying to protect me from perceived danger. I absolutely do not feel peaceful. However, if I can become aware (this comes from practice, practice, practice), instead of remaining in this state of heightened alertness, my body on guard, at the mercy of my sympathetic nervous system’s responses, I can practice peace in this moment thus teaching peace. I can be aware of my body’s fine-tuned, immediate response to danger and thank it for trying to help me but let it know that I am not in mortal danger. I can consciously deepen my breath which will in turn begin to relax my musculature. I can lower my voice instead of raising it. I can find my ground, sending breath with complete exhales into the earth-source through my feet, visualizing them taking root like a giant tree. I can lay my hands on my solar -plexus and heart chakras, breathing into and out of my groundedness and into and out of my heart-space. I can listen instead of speaking. I can look beyond what is apparent (tension, anger, unrest) and see– see “beyond boundaries” what is whole and true and pure and good, attending to that, realizing that, acknowledging the Presence of Great Spirit fully present and operating here and now, even while what is apparent seems difficult or insurmountable, knowing the Truth of Being instead. I have watched the energy of unrest dramatically shift to the energy of peace in myself and others, alone and in couples and in groups repeatedly using these practices, among other practices. My decades of study and practice of Reiki, Qi Gong and Healing Touch, my understanding, by practicing, how to watch and wait without expectation for certain outcomes, to ground and connect to Spirit has taught me that being at Peace, like loving, is not a state of being that arrives and remains in me. It is instead, a choice. A choice that must be made and practiced circumstance by circumstance, day by day, moment by moment. Vigilantly. Forever.